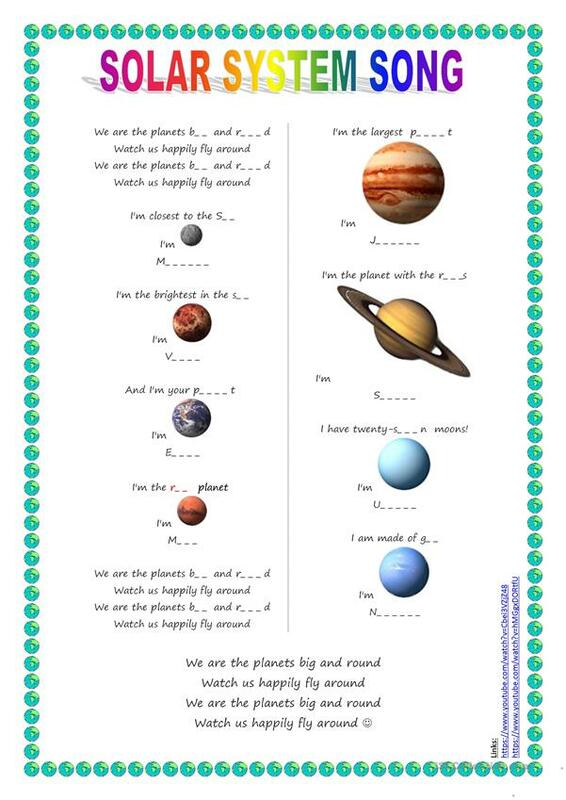 This is a worksheet I made for my son, he´s studying the planets at school. They listened to this song in class and he loves it, so he asked me to make a worksheet. It is very easy. I also uploaded a post-listening activity, a crossword based on the song. The links are provided, or you can search in google/youtube for "we are the planets big and round", there are a lot of "planet song" otherwise :) The first link has partial lyrics on screen, the second has a slightly different animation and only planet names on screen. I hope you like it! This downloadable worksheet is recommended for elementary school students and kindergartners and nursery school students at Beginner (pre-A1) and Elementary (A1) level. It was designed for strengthening your pupils' Listening and Spelling skills.